Our guy “Cy” was born “Cyril Berman” in Sharon Springs, NY in 1912. After earning his accounting degree, he married and moved his family to New York City where he worked at Pinchon Bottham & Vamoose Accounting from 1935-1976. And from his very first day on the job he was assisted by a very capable secretary named Holly Daye. Well, Holly happened to know every single bargain in the city, so each year she saved herself quite a Christmas bonus. She saved so much money, in fact, that the other secretaries began giving her the money from their bosses to buy their wives’ presents. Holly could shop for all of the executives in the entire firm and be done by 1pm with hundreds of dollars left over. Soon it became tradition for Holly to invite the other secretaries to lunch with the money she’d saved. As these ladies sat around the fanciest restaurants in New York, trying on the latest hats, jewelry and furs just purchased for their bosses’ wives, they would lift a toast to Cyril Berman…the man who started it all…and cheer: HAPPY CY BERMAN DAY! 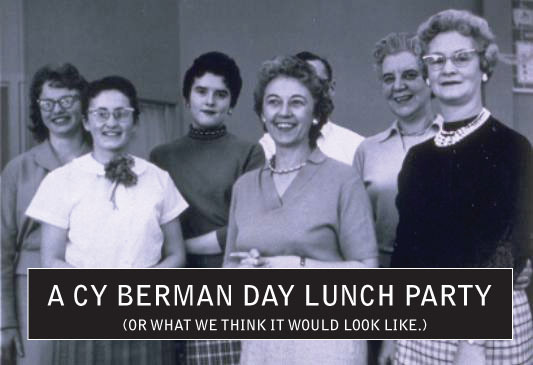 So while you’re sitting at your desk this Monday morning thinking about how long and expensive your shopping list is, we invite you to check out the “Cy Berman Day” sitewide special at Beekman 1802. We think Holly would be proud.